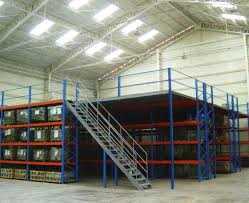 A rack supported mezzanine is an exceptional choice when pallet storage is needed below and on the perimeters of the structure. The mezzanine structure can be constructed within the racking (over aisle space) to create walk space or on top of the racking to create additional operational space. Our mezzanines provide economical square footage and versatility. For a Rack Supported Mezzanine in Chicago, Illinois, Wisconsin, Indiana, the Mid-West states CSI is your logical choice. Speedrack and Steel King are exceptional manufacturers of Rack Supported Mezzanines and are who we most commonly utilize. Rack Supported Mezzanines are engineered structures. Contact us and get the process started. IF YOU DO NOT SEE SPECIFICALLY WHAT YOU ARE LOOKING FOR, Contact us. We offer a wide variety of rack supported mezzanines, including type of racking, decking, railing, custom designs, designs for specific purposes, seismic, and more. Our objective is to assist you in obtaining your goals and objectives. If it is determined that a rack supported mezzanine will not assist in achieving your objective we have several forms of mezzanines for many different objectives and environments: Structural Mezzanine, Shelf Supported, Work Platforms, and more.